The Fluke 434 / PWR Power Supply Analyzer is the ideal tool for determining energy consumption in commercial buildings, facilities and equipment. 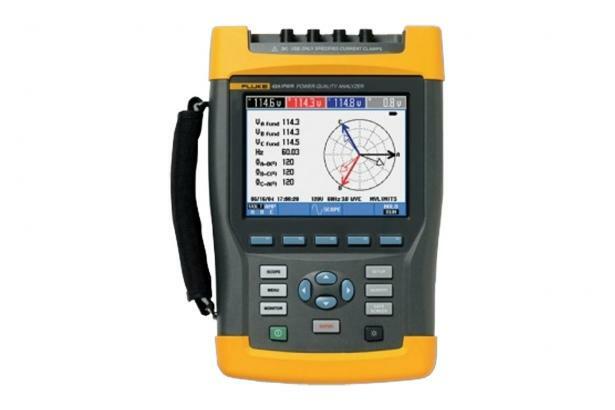 Electricians, field technicians and maintenance technicians can carry out energy consumption studies and load-flow analyzes with this special measuring device version as well as record and analyze the network and voltage quality according to EN 50160. The Fluke 434 / PWR as a comprehensive troubleshooting tool in three-phase systems measures virtually all parameters of the power supply system: voltage, current, frequency, power, energy consumption, cos φ or power factor, unbalance, harmonics and intermediate harmonics.